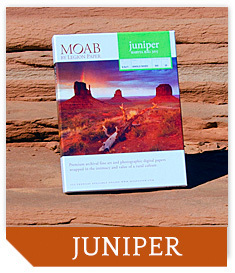 The new Juniper Baryta Rag 305 is a 100% cotton, true baryta (barium sulfate) fiber paper that offers the density of a traditional darkroom FB-type paper to hold detail in the deep blacks of the shadow regions, while producing natural white highlights that’s enhanced with a slight fiber glossy surface texture. Among the majestic buttes and mesas of Canyonlands stands the fibrous Juniper Tree, adding detail, color and contrast to the landscape that gave us inspiration for our new Baryta Rag. 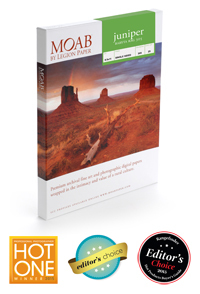 This new family of paper expands on the range of Moab’s premium 100% cotton papers made in the USA such as the renowned Entrada Rag family.